Tuesdays Or9820186590 (Mohan Parmeswaran, Secretary - Billiards). 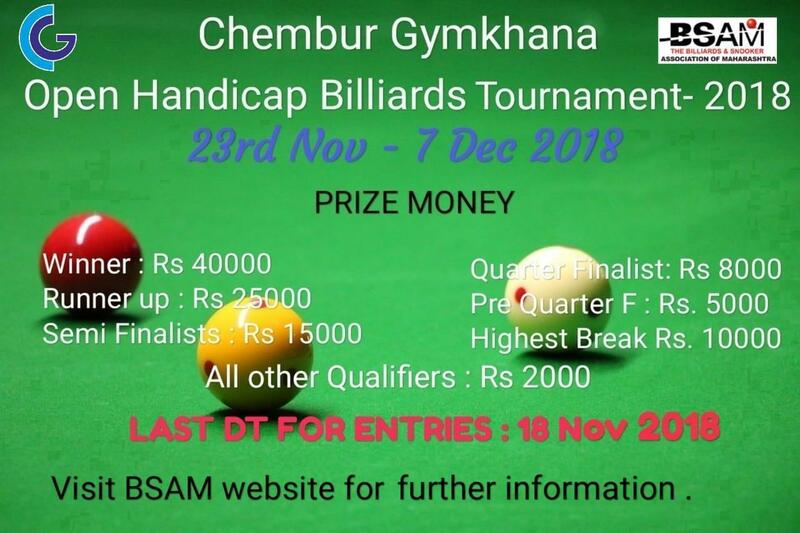 4 Qualify from Chembur Gymkhana internal rankings for the main draw of 32. 8 groups of 4 Players each (Round Robin). 2 Players from each group Qualify for the Pre-Quarter Finals. All Prize winners MUST be personally present at the Prize Distribution Ceremony. Prize Money will NOT be given away after the Date of the Ceremony. • The draw will be put up also at the Venue. • Matches once scheduled will NOT be adjusted.